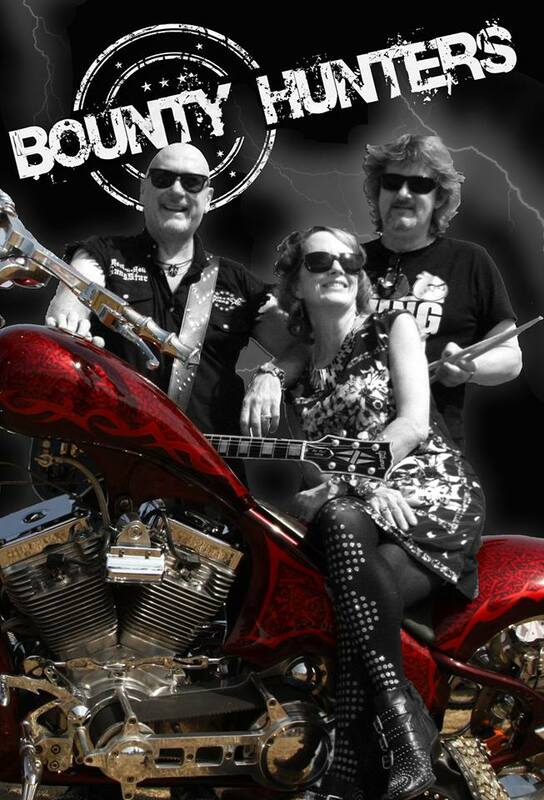 Bounty Hunters are a Blues/Rock power trio based on the Mid North Coast of NSW, Australia. All members are seasoned veterans of the rock scene, with lead guitarist David Hinds having played in top Australian touring rock bands Rabbit and Finch/Contraband in the ’70’s, with whom he appeared on iconic TV shows such as Countdown, Sounds and Hey, Hey It’s Saturday. He toured with the likes of Ted Mulry Gang, Dragon and Status Quo. David’s wife, and the band’s lead singer and bass player, Lyn Hinds, played in bands in Sydney in the ’80’s and held down residencies in such iconic venues as The Sydney Hilton. Hard hitting drummer Rob Lyons played in rock bands all up and down the eastern seaboard of Australia. They have 2 full length albums of original material under their belt, 2007’s Bounty Hunters and 2014’s Rise, with a 3rd album, Rollercoaster, due for release in June 2016, all distributed by MGM Distribution and available from Sanity, JB HiFi, Waterfront Records, Birdland Records and iTunes. Bounty Hunters can tailor their shows according to the venue, playing all originals, all covers or a combination of both. They have won several industry awards for their work, including 3 AIMVA’s (Australian Independent Music Video Awards) and have been finalists in the Australian Songwriters Association Awards, The Stuart Epps Competition on Loop Radio, for which they won Album artwork and video production by Honourable Johnny Gibson of Lawsuit Pending Records, Musicoz, Global Battle Of The Bands Australian Final and Foxtel’s Band Wars. They were named Band Of The Year 2015 by the international Dolphin Entertainment Group based in Chicago USA. 2016 is busy with festival appearances including Blues & BBQ and Motor Mania in Port Macquarie, The Long Flat Music Festival, UBERfest Summer in Sydney and the Bay Of Islands Jazz And Blues Festival in New Zealand. Also support slots with Mental As Anything and Shannon Noll. In February 2016 Bounty Hunters placed 1st in the Grand Final of the Vibrations band competition at the Valve Bar in George St Sydney. 36 bands entered the heats. They won studio time and their own headlining gig at the venue on 1 May. 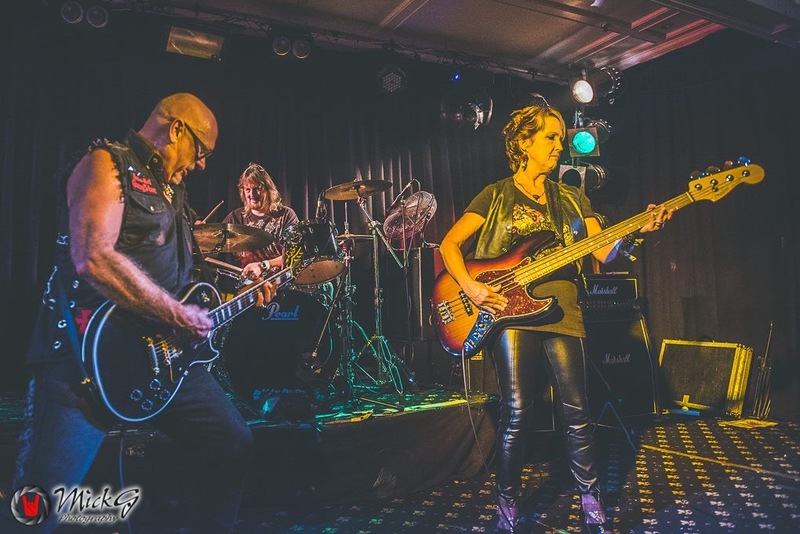 Bounty Hunters deliver a high energy show featuring the soaring vocals of Lyn and the incendiary guitar work of David, all underpinned by the thunderous rhythm section of Lyn’s bass playing and Rob’s drumming.